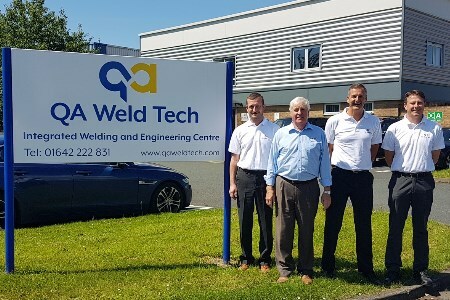 QA Weld Tech has announced that it has secured a world leading quality standard becoming - to its knowledge - one of first businesses in Teesside (UK) to secure the accreditation. Based in Middlesbrough (UK), the welding and engineering experts were presented with the ISO 9001:2015 and 14001:2015 accreditations only four months after kick starting the process to secure them and – alongside this – have also been boosted with the successful retention of a number of other quality standards. The 9001:2015 standard – only published in September 2015 – is the most rigorous quality standard introduced to date and, as such, companies across the UK have been given up to three years to implement the systems needed to secure it. Yet, true to form, QA Weld Tech in its constant pursuit of market leadership secured the standard in only four months having set itself the challenging timeframe to do exactly that. Speaking about the accreditation award, Charles Tighe, MD at QA Weld Tech said: “The auditors were extremely complimentary about the progression the company has made over the last couple of years and were very encouraged by the direction in which it is heading. We pride ourselves on the fact that QA Weld Tech has a reputation in the region for consistently driving standards and being at the forefront of its industry. For us it was therefore extremely important that we set ourselves the very demanding schedule we did for securing this quality standard. The standard – which is the toughest to date – means firms across the country have to implement systems that ensure all work processes, risks and opportunities, methods of work and management planning is documented and, key to this, is that all employees have to understand them. For QA Weld Tech, this involved a full revamp of its management systems combined with the training of all staff across its Middlesbrough site. Founded in 1980 by Welding Engineer and current Managing Director, Charles Tighe, QA Weld Tech has carved a reputation in the oil and gas sector working with major companies including Total, BP, Shell and GE. The company began its operations from a 600 m2 unit on Riverside Park Industrial Estate, Middlesbrough and now occupies nine adjacent workshops at the Riverside location, providing production space in excess of 4600 m2.